We headed out west (driving) to California and Utah a couple of weeks ago. We managed one clear night out of seven nights total for exceptional viewing. Unusual for out west as it’s usually clear most of the time. But they have been experiencing torrential rains and major flooding lately. Portions of Zion and Arches were closed before we got there, but opened while we were there, only to be closed again after we left. We lucked out and were dry most of the time. The last night we were at Arches it was clear, except on the horizon, in just about every direction. There was a large thunderstorm off to the northeast on the horizon (over Grand Junction, Colo.). I spent most of the time viewing rather than imaging, as there was just so much that I wanted to see in a “real” dark sky. Plus the clouds were starting to roll in after a few hours. It just blew me away how dark it was and how much I could see! M27 was extremely bright in the scope! Eagle, Trifid, Lagoon, Omega Nebulas were all very easy to see! 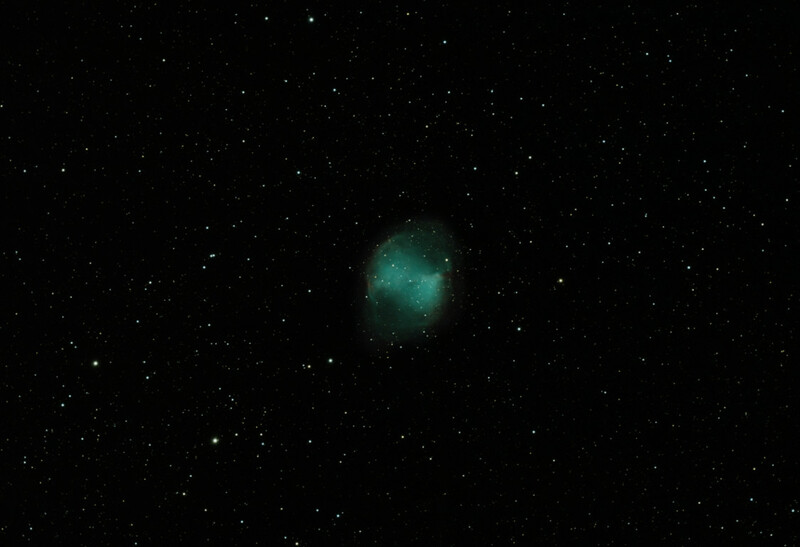 Even M97, the Owl Nebula, was not that difficult to see, and it was low to the horizon. One object that I enjoyed viewing was NGC 7662, The Blue Snowball Nebula, a small planetary nebula not much bigger than Saturn. It kind of looks like very large hazy blueish star. This entry was posted in Uncategorized and tagged astrophoto, Dumbell Nebula, M27, Utah. Bookmark the permalink.